For rent is here a cozy apartment Souterrain, with its own lockable access. The apartment has 2 bedroom / living room, hallway, bathroom with shower and a fully equipped kitchen (induction hob, exhaust hood, fridge / freezer, microwave, oven, kettle coffee, tea towels, dishwashing and cleaning products, dishes and kitchen utensils). There are two large double beds with new Dibapur ® Pro Vital orthopedic foam mattresses available (14 cm, medium firm to firm - particularly suitable for allergy sufferers.) Beds equipped with lightweight duvets and pillows 40X80 cm (optional large pillows possible). The rooms are both equipped with a TV, sofa and desk. Hygienic, durable textile flooring and underfloor heating provide allergy-friendly climate. The room can be darkened with blinds and curtains. - Towels and bed linen incl. Linen change every 7 days inclusive. Double bed with orthopedic new foam mattresses 90x200 cm, wardrobe, chest of drawers, dining table with 2 chairs, desk, floor lamp, wardrobe, mirror, CD / radio, textile floor covering. On IHEM desk you will find a folder with a wide range of information, links and suggestions for things to do sightseeing and shopping, in both German and English. The apartment is beautifully situated in a 3-family town house in a residential area with apartment buildings and gardens and narrow streets. The windows located to the garden side. Nevertheless, central location with good transport links. The city center is in 20 min. By tram to reach that distance is within walking distance in 6 minutes.. Easy access as well to bus X54 and S-Bahn. If required, a cot for infants, high chair and potty can be provided. Shopping for self-catering near:. Lidl 5 minutes walk and more like Kaufland, Netto, Aldi and retail stores and two gas stations. In the green surroundings of Berlin can be reached quickly via the motorway slip road A114. Nearby also hold two night bus lines so that visits the center hour by public transport are also possible to later (4p ticket € 9.00). It is also favorable to use the tourist card for public transportation in Berlin (including ferries the White Fleet. A great way to explore the beautiful surroundings of Berlin also provides the train of Regio trains that stop at all major railway stations in Berlin. Winter sports enthusiasts do not have to travel to the Alps to experience snow fun. Also from Berlin there are ways promptly to go skiing or snowboarding. Snow lovers can travel in three hours (by car) to the ski weekend. Snow there is enough in the highest mountain range in northern Germany. on the 1141 meter high Brocken, there are ever two or more feet of snow height, so that the area with its old town is also worth a visit in any case. When snow conditions are 30 runs with about 17 kilometers total length and about two dozen tugs and double chairs for alpine skiers in operation. The ski resorts in the Harz Mountains are often the target of daytrippers, and many townspeople from Berlin. Places for alpine skiers in this region are Braunlage, Hahnenklee and St. Andrew Berg. For excursion tips and different ways in Berlin, we have designed a small assortment in the apartment and are also happy to answer your questions, as far as we are able. Welcome to the city of 1000 possibilities! We look forward to your visit. Cot for children: once per object for rent at a price of 10 EUR (optional). Visitor's tax: per object and day Costs amounting to 5 EUR (Mandatory). 1. The owner uses a large property management company. VBRO requires a credit card but they don’t actually process it. You will receive an email from the property management group requesting payment. If you don’t pay within 24 hours your reservation is cancelled. 2. You then need to contact the property owner directly for details on checking in. The owner required a cash cleaning fee and refundable deposit. 3. The property owner does not speak English. I had to communicate through email using Google Translator. Response time for answers ranged from an hour to a couple of days. This was a real problem when I was trying to find out how to get my deposit back. We left the property at 7:18 a.m. and the owners response was that he would have set an alarm if he had known we would leave early. Needless to say I didn’t get my deposit back and am being told that it will require a bank transfer that I will need to pay for. We have been on a three week trip through Germany using VBRO. All of our other experiences have been great. I recommend using caution with this property. I say this at the risk of never seeing my deposit. Die Ferienwohnung liegt in einer schönen und ruhigen Gegend von Berlin. Mit der Tram ist man trotzdem schnell im Zentrum. Einkaufsmöglichkeit ist auch in 3 - 5min Fußweg erreichbar. Die Wohnung selbst liegt im Souterrain, war sauber und alles da was man so benötigt. Der Vermieter war hilfsbereit und steht für Fragen auch gerne zur Verfügung. Gewoon een goede woning om een paar dagen in Berlijn te zijn. Dit was gewoon een goed adres om een midweek in Berlijn te zijn. Binnen een half uur van voordeur tot Centrum met de tram. Zeer compleet appartement. Schoon. Goede bedden. Goed sanitair. Minder geschikt voor (kleine) kinderen omdat er weinig te doen is voor hen (bijv. geen tuin en geen speelgoed). gute Ferienwohnung in einer guten Umgebung. Man fühlt sich dort wohl und kann sich erholen. Es fehlt nur ein zweiter Schlüssel, um ggf. eigenständige Unternehmungen zu machen. Super Lage, nahe zum Zenrtum, günstige Unterkunft, sauber und praktisch. 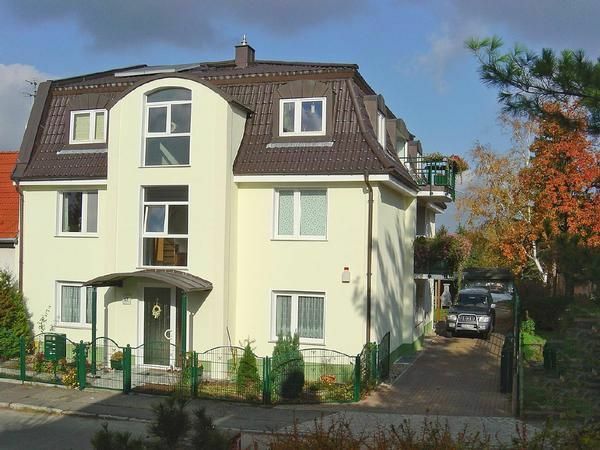 Pankow-Heinersdorf is a green district in the north of Berlin, which is very conveniently located to downtown. The apartment is located in an area with family houses and gardens. In the district of Pankow you find many shops, a very beautiful castle park, a library, two lakes, theater and much more. Up in the center to Alexanderplatz you need by public transport only 25 minutes. The tram M2 goes 5 minutes away. There is also a night bus, which stops nearby. Cot (per property and day, included in price 10 EUR).